Hello beauties!! Hope you all had a great Holi! I had a super relaxing Holi, caught up on sleep, watched movies, ate good food and relaxed some more. My hand and feet remain dry not only throughout winters but also throughout the summers. I was looking to purchase a foot creme after my last creme finished, I stumbled upon Venustas Essentials Hand and Foot Salve which I am gonna review after several weeks of use. But before starting I would like to introduce you to the brand. Venustas Essentials is a brainchild of Mrs Seema Rai who painstakingly handcrafts skin, bath and hair care goodies in her kitchen with ingredients that are carefully chosen. The brand is based in New Delhi, India. Blessed we are to be gifted with the priceless treasures the nature has to offer. Venustas Essentials is a small initiative to carry forward the legacy worthy of future generations. 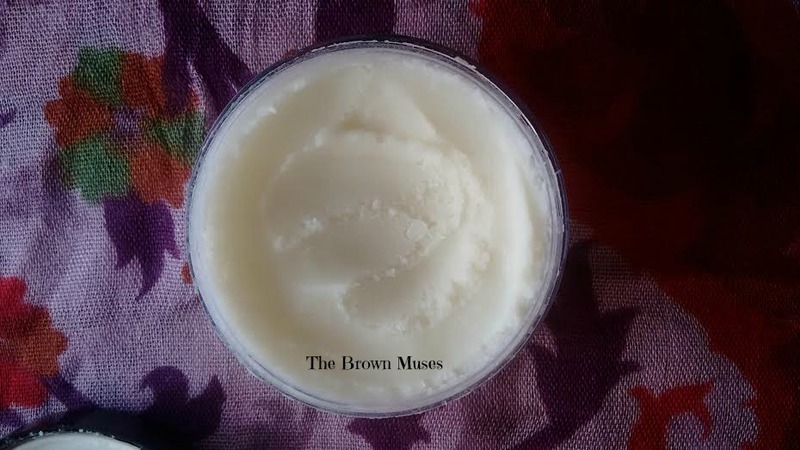 Ingredients: Mango butter, shea butter, sweet almond oil, coconut oil, vitamin E, tea tree EO, lavender EO, eucalyptus EO. 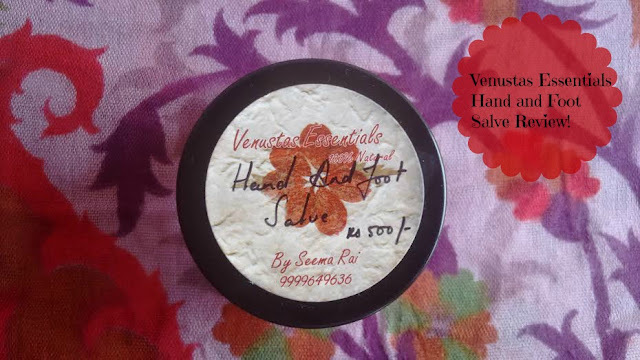 Venustas Essentials Hand and Foot Salve has a solid consistency, crumbly texture and it melts upon touch. The salve has a mild fragrance of eucalyptus oil which doesn't bother the olfactory system. 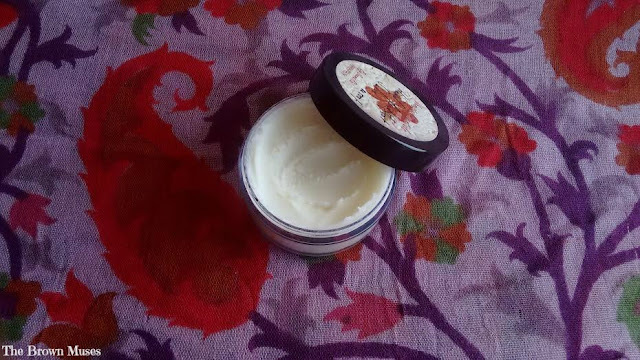 The salve is non greasy and sinks into the skin upon gently massaging. I use the pea sized amount of for each foot post bath and wear socks. I've noticed the salve works better like that and more so if the feet are freshly exfoliated as the skin is able to absorb the moisture better. It's non greasy and doesn't leave any sort of greasy residue behind. The salve contains skin loving butters like mango and shea which take care of the excessive dryness and make the feet smooth and soft. Additionally the skin on the feet look healthy and cared for. The addition of essential oils like tea tree and eucalyptus help in combating bacterial infections and odour as these oils contain anti-bacterial and anti-inflammatory properties. The salve also lends a cooling sensation upon massage which a tad bit long if you immediately wear socks post application/massage. Overall, VE Hand and Foot Salve is a great addition to your foot care routine. Due to it's all natural ingredients it's super moisturising and contains anti-bacterial properties to help protect against feet infections. Will I recommend: I sure would! All natural, handmade and not tested on animals. Non-greasy and gets absorbed by the skin easily. Has a very mild fragrance of eucalyptus oil. Lends a cooling sensation upon application. Takes care of excessive dryness and make the feet smooth and soft. Contains EOs of eucalyptus and tea tree which help take care of odour. Availability - Not for me as I don't mind buying online.